German architect Heike Hanada has completed a minimalist concrete museum to celebrate the Bauhaus in Weimar, where the design school was founded 100 years ago. Named the Bauhaus Museum Weimar, the building dedicated to the design school creates a physical cultural presence for the Bauhaus in the German city where it was based between 1919 and 1925. "After many years of planning and building, the moment has finally arrived: the completion of a building with a striking urbanistic presence," said Hanada. Located near the Nazi-era Gauforum square and the Neue Museum Weimar, the Bauhaus Museum Weimar is a simple five-storey concrete box broken only with its entrance and a couple of windows. "The new Bauhaus museum in Weimar is reduced to a clearly defined geometric form. The enclosing shell of light-grey concrete lends the cube stability and dynamic solidity," said Hanada. "The monolith stands firmly planted between downtown and the Schwansee Park, and its body of poured concrete creates structure and spaces within and without." Equally spaced horizontal grooves run around the facades of the museum, with the words "bauhaus museum" repeated in a band near the top of the building. LED strips have been embedded in the facade to illuminate the building at night. Photo is by André Kühn. Hanada designed the museum to be a public building for the city and has attempted to clearly connect it to the neighbouring park. "The role of the museum is defined by its responsibility as a public space in the city," she said. "With elements such as plinths, fasciae, portals, stairways and a terrace to the park, the architecture incorporates classical themes that underscore its public character." 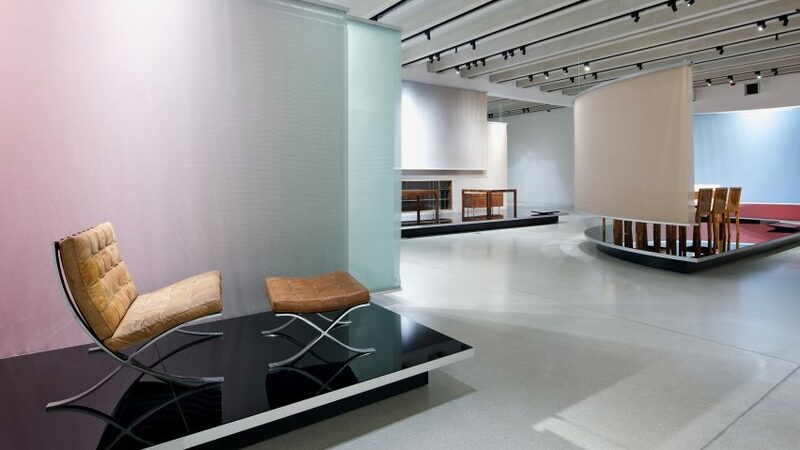 The museum contains 2,000 square metres of exhibition space, which will be used to display around 1,000 items from the Weimar Bauhaus collection. A shop and entrance hall is located on the ground floor, with a cafe and toilets below, and three floors dedicated to telling the story of the Bauhaus above. Each of the galleries overlooks double-height spaces and are accessed from a long ceremonial staircase that stretches the height of the building. "The visitors ascend a succession of interchanging open spaces and staircases until they finally arrive at the top floor where they are presented with an unobstructed view of the park," said Hanada. "The cascading staircases are encased by ceiling-high walls and function as free-standing, enclosed bodies in the interior space." The collection is arranged to inform visitors about the history of the design school, with the gallery on the first floor dedicated to its origins in Weimar and the Bauhaus manifesto that Walter Gropius wrote in 1919. The second floor has exhibits that show how these ideas were implemented, with galleries dedicated to each of the Bauhaus directors – Gropius, Hannes Meyer and Mies van der Rohe – at the top of the building. The museum in Weimar has opened to coincide with the centenary of the Bauhaus, which was established in the city in 1919. The school was forced to relocate from Weimar to Dessau in 1925, where Gropius designed a new school building for the institution. Following a short time based in Berlin the school closed for good in 1933. Although only open for just over a decade, the Bauhaus is the most influential art and design school in history. The ideas and people associated with the school had an incredible impact on design and architecture, and to mark its centenary we created a series exploring its key works and figures. Photography is by Andrew Alberts / Heike Hanada Laboratory of art and architecture, unless stated.